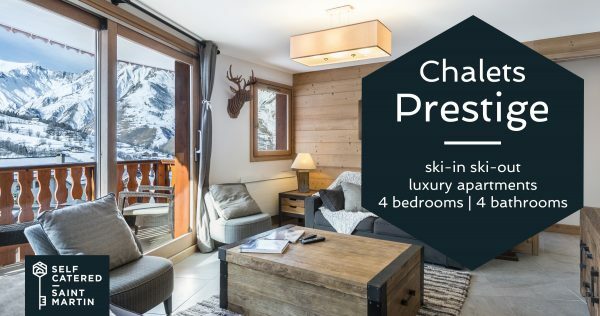 We are thrilled to announce our stunning new additions this winter – Chalets Prestige – with ski-in, ski-out access in the heart of St Martin village! The Prestige chalet apartments are situated directly next to the drag lift and village ski slope in St Martin de Belleville. These luxury ski apartments have a perfect ski-in ski-out location. Being situated in a larger apartment block means you have to walk some stairs however it makes these apartments affordable and once you are inside you feel like being in a homely Alpine chalet. All Prestige apartments have 4 bedrooms with en-suite bathrooms, perfect size for 8 people. The open-plan kitchen, living and dining areas have access onto balconies with beautiful mountain views! Find out more about our stunning Prestige Apartments.